You know when a “scene” festival lineup is pretty damn strong? When you have Taking Back Sunday, Say Anything, and Saves the Day below the halfway mark of your poster and Brand New on the third line. 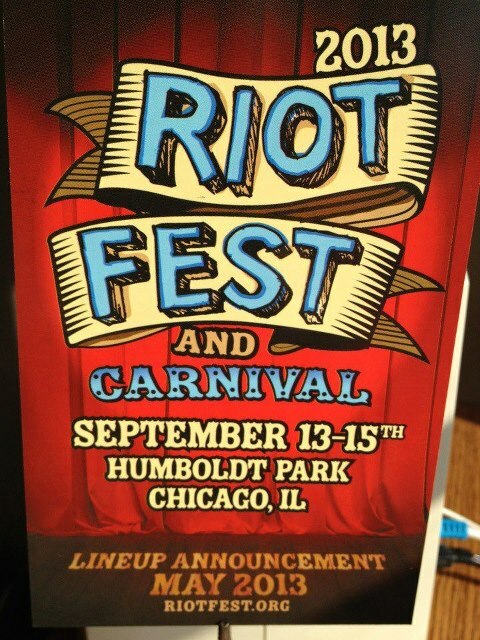 As announced by our fellow AbsoluteVoices website PropertyOfZack, this year’s Riot Fest will feature (and take a big breath and sit down before reading all of this) Blink 182, Fall out Boy, The Violent Femmes, Motorhead, Sublime With Rome, Rancid, AFI, Blondie, Public Enemy, Brand New, Flag, Taking Back Sunday, Rocket From The Crypt, Bad Religion, Atmosphere, The Dismemberment Plan, Dinosaur Jr, X, Devotchka, Yellowcard, Screeching Weasel, Pennywise, The Broadways, Against Me!, Bob Mould, Gwar, The Lillingtons, Best Coast, The Lawrence Arms, Say Anything, Bad Brains, Quicksand, The Selecter, Bad Books, Mission Of Burma, The Devil Wears Prada, Saves The Day, Glassjaw, Bayside, Stars, Toots and the Maytals, Peter Hook (performing a Joy Division set! ), Smoking Popes, Reggie and the Full Effect, Attack Attack!, The Dear Hunter, Maps and Atlases, Surfer Blood, Chuck Ragan, Dessa, Saul Williams, Empires, Memphiskapheles, Kitten, Peelander-Z, Touche Amore, Masked Intruder, Deal’s Gone Bad, Twin Peaks, Flatfoot 56, and White Mystery. There’s also at least one major headliner yet to be announced, with more bands to come. Tickets start at $23 a day; the festival is being held September 13 through 15 in Chicago. Buy tickets or see the official website here. View the festival poster after the break.